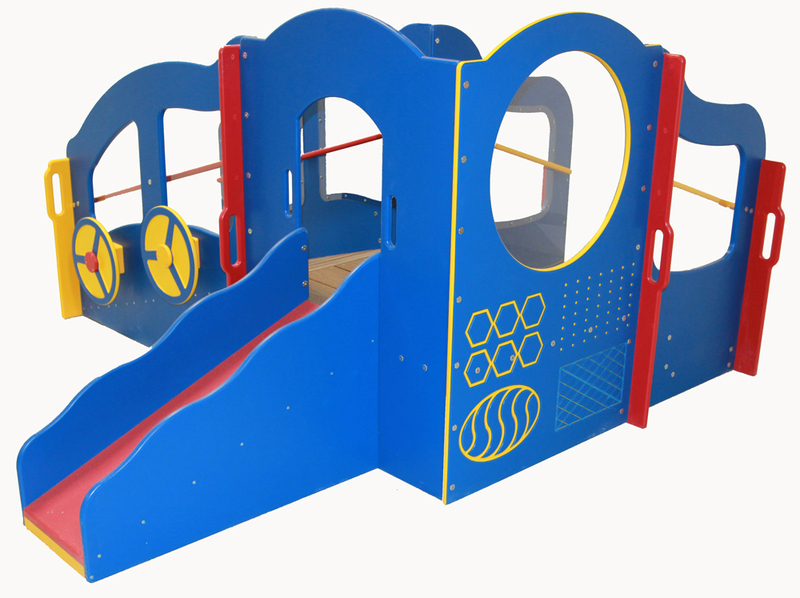 The Ultimate Infant/Toddler Deluxe Transitional Outdoor Playground Structure, Bright Colors. 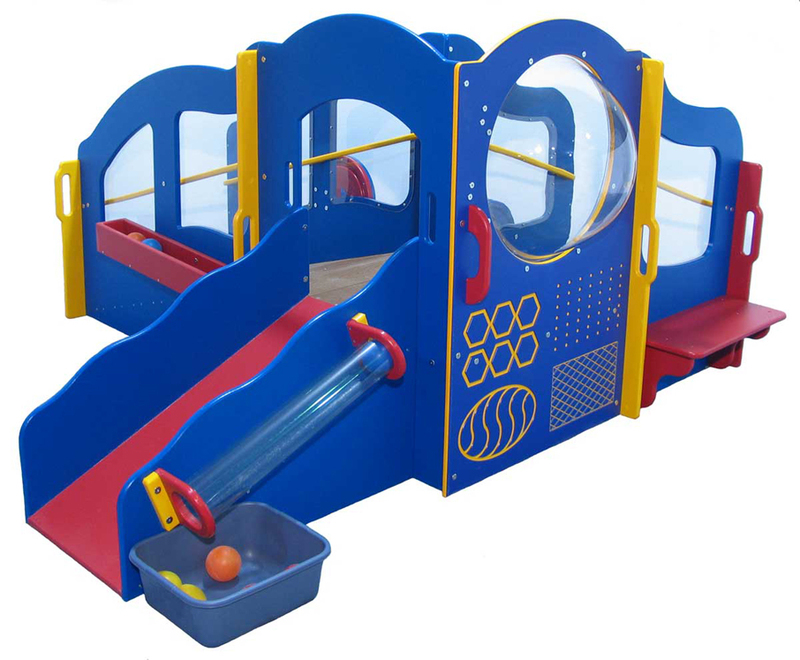 This wonderfully designed system includes an incredible array of play events and is an essential tool to assist young children just learning to walk. The age and developmentally appropriate structure supports many early developmental skills including gross motor skills, cognitive and creative play skills, as well as social emotional skills. The entire totally transitional system includes various hand rails and features throughout, providing support, to assist early walkers to become mobile. Crawlers will pull themselves up to a standing position, learn to balance, then use the features for stability as they cruise from play station to station. 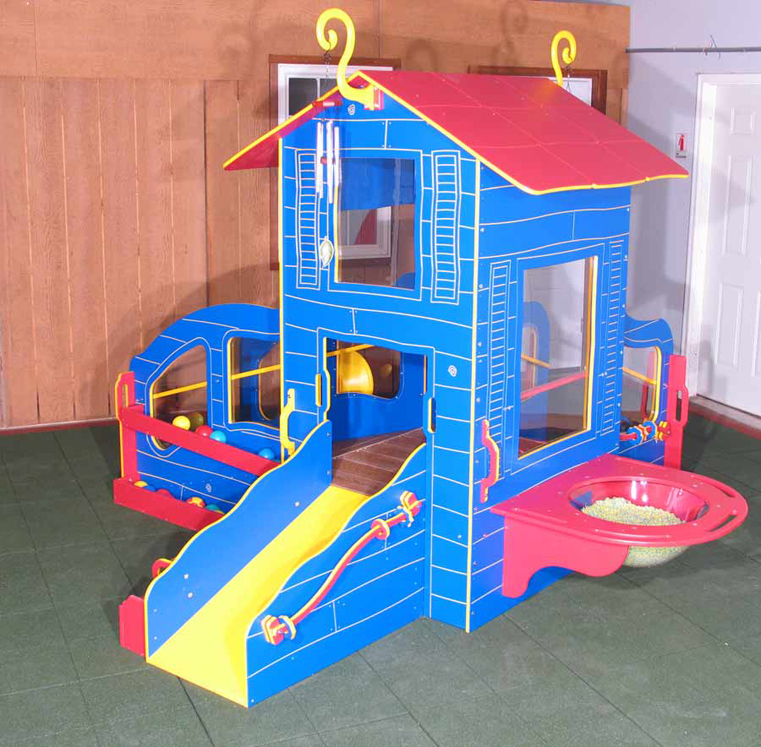 Includes 1-set of safe, extra deep steps to a 20"h deck, w/closed off risers and hand rails which support children's mobility and safe pattern of play as they balance and navigate the stairs. The landing at the bottom of the steps creates an extra gathering space for the child to interact with others. 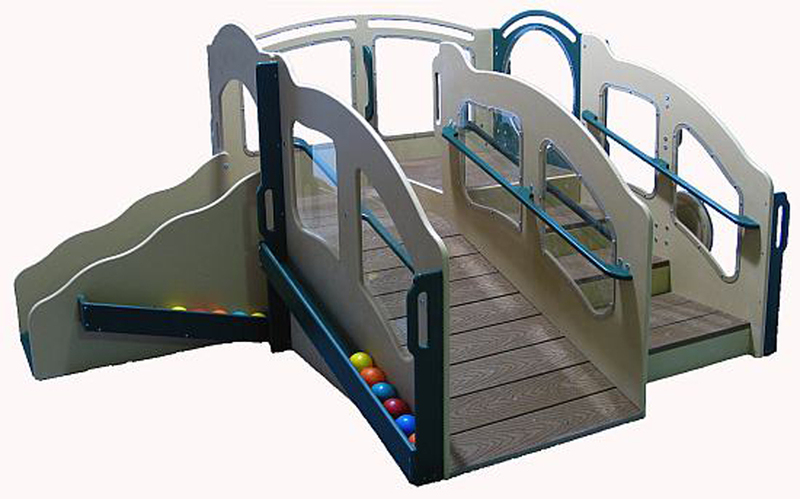 The included ramp to the 16"h deck supports mobility for crawlers transitioning to walking. The hand rails between the two level decks allow for a safe transition. The width of the stairs, ramp and decks are designed to be ideal for a child to grasp one hand rail while climbing, as a second child may grasp the opposing rail to exit down, safely and simultaneously. The two-color texture panel with balance rail supports the development of tactile and visual perceptual skills. The dual tracking tubes with Storage Bins helps develop eye-hand coordination and supports early pre-reading skills (learning to track from left to right). 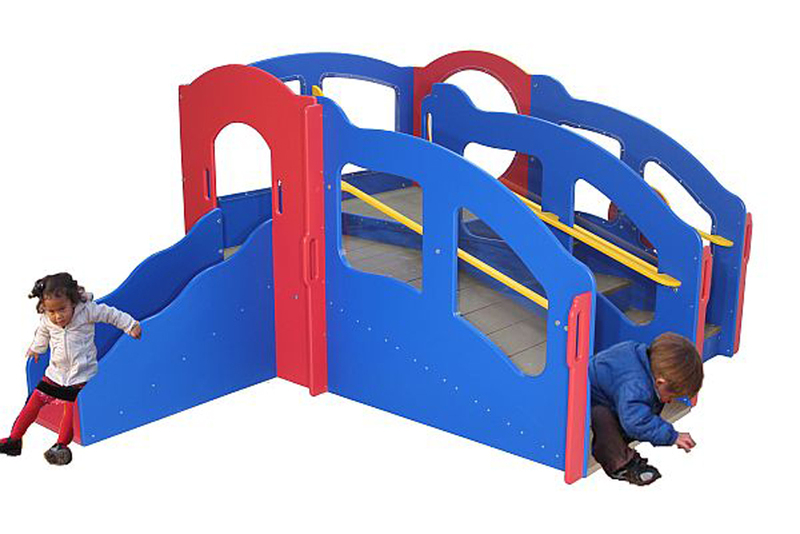 Also includes 1-Slide w/safety barrier above to prevent 'headers' by requiring the child to sit before exiting. 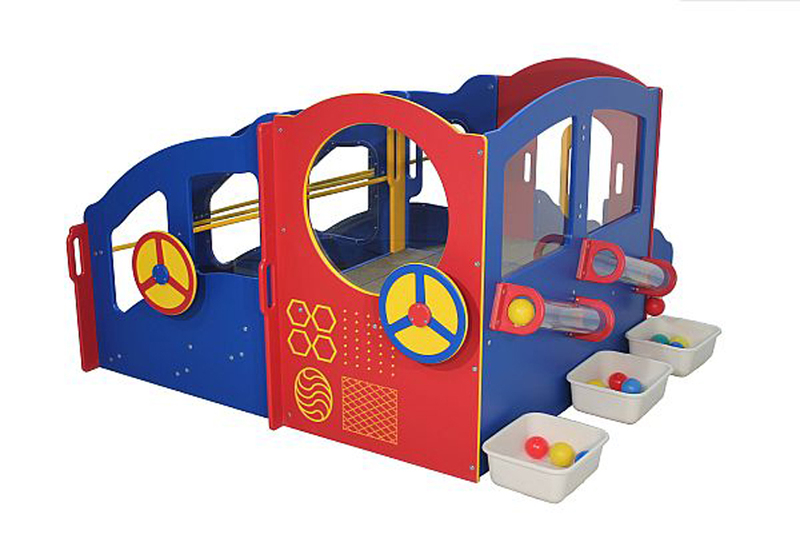 Two steering wheels are placed close enough to promote cooperative play without conflict. 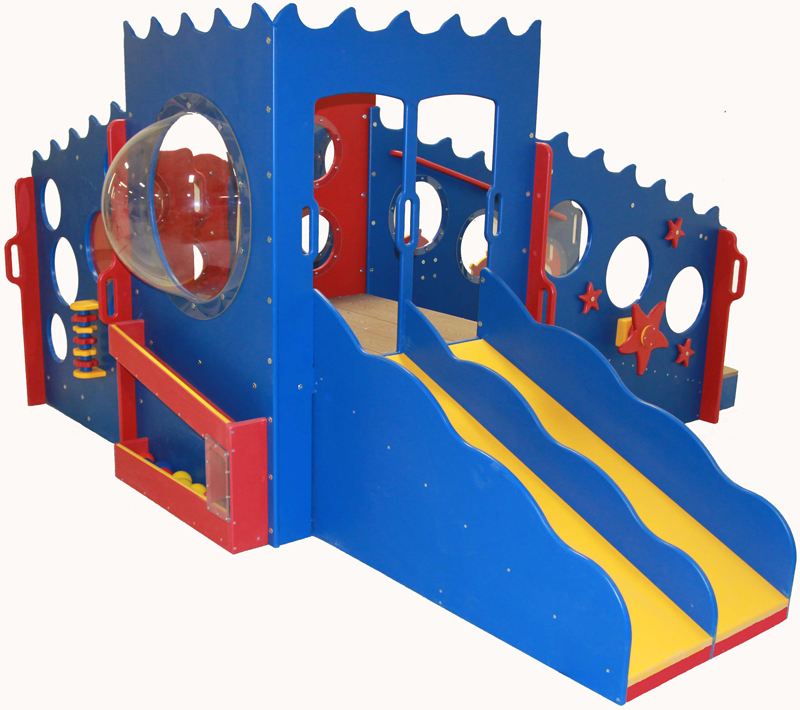 1-Tracking Rail, 2-Tracking Ball Roll Chutes and 1-Bubble Window complete this structure. Indestructible polycarbonate windows throughout for visibility. Extremely heavy duty 3/4" Polyethylene construction. Meets and/or exceeds ASTM F 2373-07 Standards and CPSC Guidelines. 116"w x 96"d x 48"h, 1-16"h 1-20"h deck. Use Zones: In a supervised, limited access setting is 16' x 14', in an unlimited access setting is 22' x 20'. Arrives semi-assembled, installation requires approximately 2-4 hours. Ages 6 - 23 mos. 15 Year warranty.